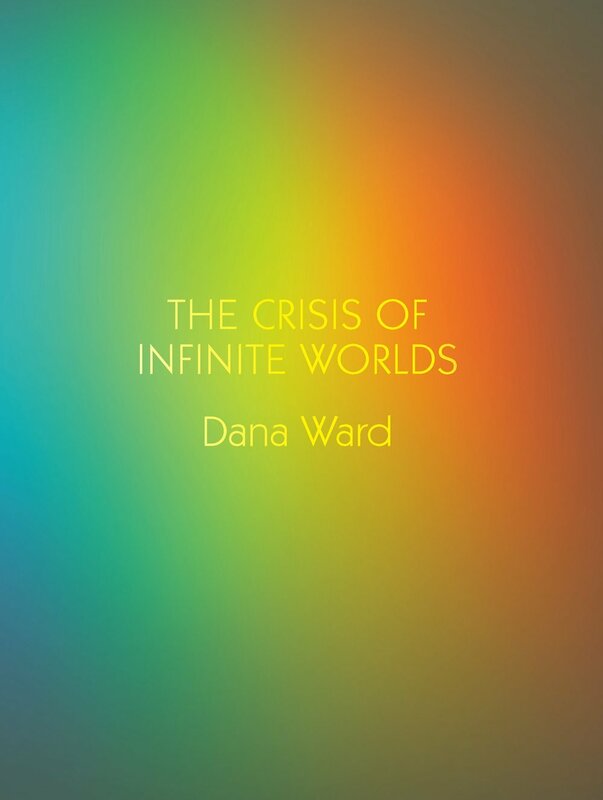 The Crisis of Infinite Worlds (Futurepoem, 2013) finds Dana Ward once again working through his unique mode of discursive poetics, shifting from one object of inquiry to the next—several times over—within the space of a given piece. But unlike his first book, This Can’t Be Life (Edge Books, 2011), which occupied itself with an “an interrogation of and an affront to poems and poetic sensibilities,” as well as problematizing “what it means to be poet,” Ward explores a new set of complications in order to ratchet up the conceptual tension within his book. One such tension that recurs throughout the entirety of Crisis is the one that develops between the poet (i.e. the subjective self) and constraint. To explain, I want to briefly reference Jackson Mac Low’s essay “Poetry and Pleasure,” which acts as an introduction to Things of Beauty (University of California Press, 2008). In his essay, Mac Low mentions that some poets and readers of poetry dislike constraint-based poems (whether bound by deterministic operations or chance procedures) because they “fear that the ‘self’—the ‘subject’—is being intrinsically denigrated.” And what, to their mind, could be cause for more “despair” than to evacuate poetry of the poet? Regardless of what one thinks about Mac Low’s poetry and poetics, he does provide us with an adequate straw man through which to think about constraints and, thus, formalism. To this end, most (if not all?) of the poems in Crisis predicate themselves upon some type of constraint that limits the composing subject and sends him in a direction he most likely would not have traveled otherwise. While Ward’s constraints and formal procedures might not be of the same degree as the poems of Mac Low, for instance, they certainly are of the same kind. For example, Ward composes “Things the Baby Likes (A-Z)” in “abecedarian tercets which are then expanded into quasi-encyclopedic entries themselves consisting of three…sentences” (57). For a poet who typically constructs texts whose forms “suggest their own limits” through more organic methods, such as “ear” and “feel” (56), the self-imposed constraints and formal structures, no doubt, are a marked change of pace. But far from writing texts devoid of a poet and “intrinsically denigrating” the self, Crisis is a book distinctly of and by Dana Ward. To this end, he emulates Félix Gonzáles-Torres—who, in Ward’s estimation, is “quite simply one of the greatest poets that ever lived”—by creating a poetry suffused in “tragic sympathy” (i.e. emotionally resonance) counterpoised with a predetermined “intelligence” (i.e. formal structure) (58). While I’m unfamiliar with the work of Torres, Ward’s ability to balance a more traditionally conceived subjectivity with rigid, external constraints does remind me of, perhaps, a more familiar poetic touchstone: Lyn Hejinian’s My Life. Hejinian’s autobiography, to my mind, succeeds because it creates an emotionally evocative text within a strict, predetermined form; Ward’s book produces similar results. The wonderful aspect of Ward’s writing, and Crisis in particular, is that he does not settle simply for yoking the tension between the binary of subject and constraint. Instead, he investigates each term further, undermining our basic presumptions about both and, thus, turning them on their heads. In “Zoning Out in Front of the Computer,” the final entry of “Things the Baby Likes (A-Z),” the poet writes of “producing myself in the factory in front of this screen” (76); in other words, subjectivity is a product, a computer is a factory, and the writing process is the assembly-line down which the subject/product travels. Conceptualizing the self as a manufactured product of consumerism hardly aligns with the Romantic notion of subjectivity; in fact, Ward’s later claim that he is “just the object of impoverished, desperate writing…dying because form is real” seems to be the exact opposite of an individuate self who expresses his inner most thoughts and feelings through verse. What happened to me in the course of using such methods for several decades was that I realized that these [deterministic and chance] methods, too, and the actions of utilizing them, are products of the ego, that the ego is inescapable. The subject might die in forms, but the forms live because of the subject. Indeed, the subject and the form (or the self and poetic constraints) are locked in a chiasmus, continually shifting, reversing, and altering one another until one cannot parse the two into distinct or separate entities. They are inextricably linked, perpetuating within these infinite worlds.